On the contrary, my mother is smart, more familiar and can deal with outside world better. Then, as a kid why I chose my dad over mom at such times? When I think of it now; I probably did not need more drama with someone who gets upset with what has happened. While in pain or have a problem, I need stability. At the moment, if I can channelize my thoughts effectively, I myself may find a solution to the best of my capacity to implement. He was that person; he is an happy person, he needs no reason but he just is. Similarly, we all have one such Father, who is ever stable, happy and peaceful - the Supreme Father/Power, God or any name you feel comfortable with at this time. If we can be in His presence for a few moments, we can draw His power to deal with the outside world. In His silence, we can let our in-tuition guide us. We just need TO BE to teach, to empower, and to help. 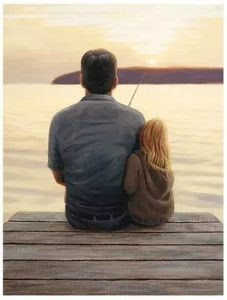 Child: You be careful Dad, for, I walk in your footsteps"
Let's take care of ourselves to take care of everyone around! Good one Rashmi! Nice writing..Keep it going! Thank you Padhma!! Means a lot!